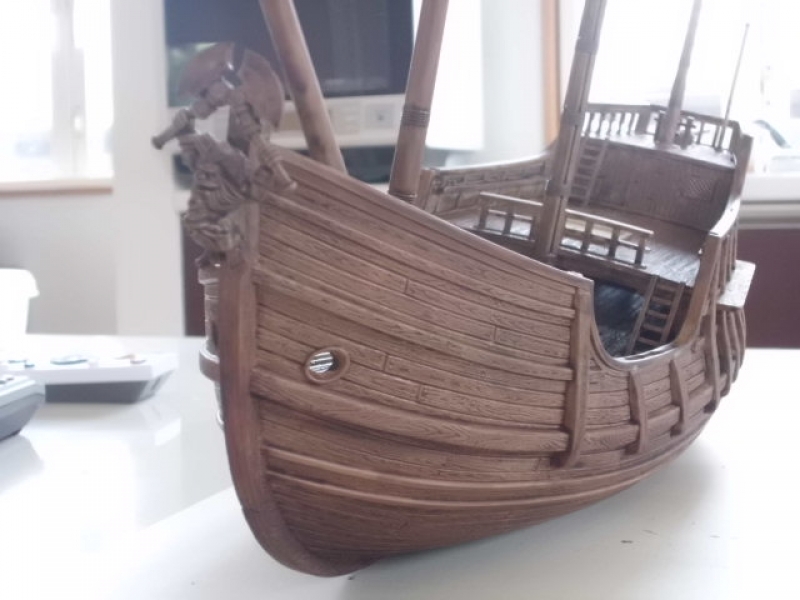 I've been wanting to try a fancy piece of water terrain for a while now - maybe a moat for the new castles, or a dock with jetties or something. 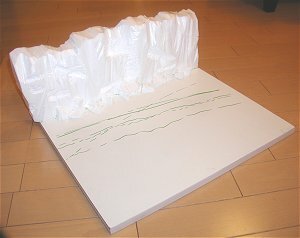 I've made a river before, using wave-shaped clear plastic sheeting cut to fit on top of an empty riverbed, but I messed up the coloration a little. 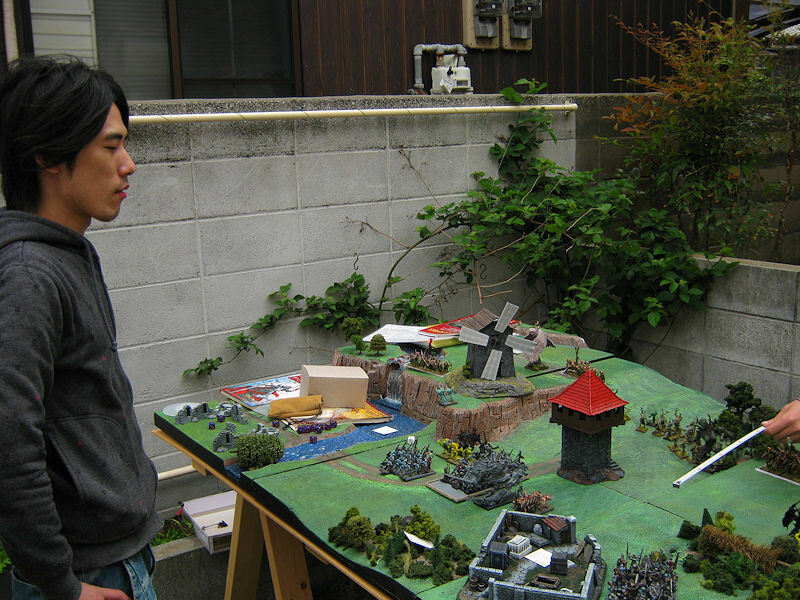 So this time I wanted to test some water-terrain products with real volume. I picked up a bag of EZ-Water (made by US company Woodland Scenics), which has hundreds of little clear blobs of ... something... er, looks like clear wax? You melt them in a saucepan over a very low heat, and then simply pour them into your terrain. 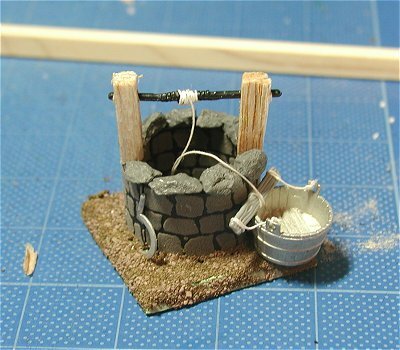 I made a simple well out of card, basla wood and a few stones, and was lucky enough to have a metal bucket in my bitz box. 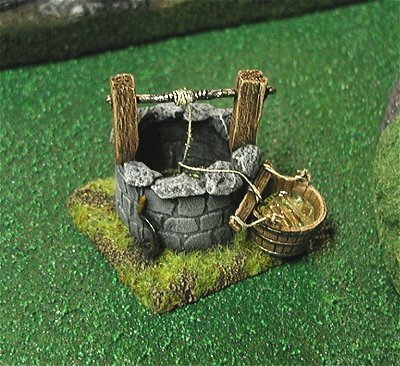 I stuck that together (left photo) and painted it, and then tried a very small handful of blobs as the water in both the bucket and the bottom of the well. I found that although it was very messy (imagine super-stringy glue gun) getting the hot glue from pan to model, these stray lines can be trimmed or pulled off easily later on. What I had trouble with was the glue cooling down too much in transfer, so it formed a sort of bead before it properly adhered to the sides of the bucket. You can see in the photo it's not quite the right shape. It probably won't be a problem for larger terrain later on, as the heat will be retained in transfer. Additionally the EZ-water has a slight yellowish tint to it, which would need to be dyed for sea water or something. Looks okay in the bucket, though! One bonus was that the EZ-water followed the slope of the bucket, so it's deeper at one side - which is quite realistic.